Over 40,000 pairs of number plates are stolen in the UK each year. Bringing untold misery on the innocent victims who perpetually find themselves having to defent themselves against NIPs, parking tickets, Concestion Tax penalties and other motoring offences committed by cars bearing plates registered to them. To help combat this, car accessory manaufacturer Richbrook has come up with a stylish and secure solution in the shape of their anti-theft number plate bolts. Believe it or not, if you're unlucky enough to have your plates stolen, the default legal position is that any crime carried out under your registration number is attributable directly to you, until you can prove your innocence. Like identity theft, the victim is liable for any indiscretions until they can come up with an adequate defence. Police statistics show that a large percentage of stolen cars use previously legitimate, stolen number plates for nefarious purposes such as robbery, petrol theft and congestion charge evasion - leaving the original registered keepers to face the music. Several manufacturers have designed 'shattering' plates that disintegrate when thieves try to steal them. Sadly this doesn't help the original owner, who then has to run the risk of driving temporarily without plates, risking a fine! external spinning washer isn't just there for looks - should a thief attempt to remove the bolts with pliers; they will simply rotate, leaving the threaded section firmly embedded in the car. Finished in anodised Staybrite aluminium, they'll keep their looks for years, even on salted British roads. 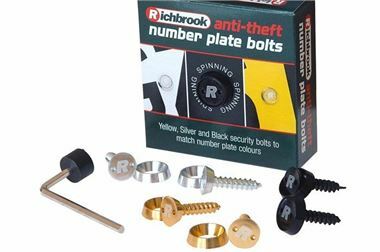 Priced at just £5.95 for a pack of 6, or £12.95 for the Official Ford and Vauxhall badged versions, Richbrook's Anti Theft Number Plate Bolts are a lot cheaper than a fine or legal representation, and look the business in the process. Faced with these deterrents, most thieves will keep on looking and you won't be a victim.